There are 13 categories this year including categories for Indigenous Peoples’ Writing, and Indigenous Peoples’ Publishing. Saskatchewan authors or publishers take note. Submissions are now open for the 25th Saskatchewan Book Awards. Submissions will be accepted until Nov. 1, for books that have been published by within the last year. Other categories include Book of the Year, Fiction, Non-Fiction, Saskatoon Book, Regina Book, First Book, Poetry, Children’s Literature, Scholarly Writing, Publishing, , and Publishing in Education. The Young Adult Literature Award is not being offered in 2018, but will be offered again in 2019. The Saskatchewan Book Awards was formed in 1993 and remains the only provincially-focused book awards program in Saskatchewan. The 13 award categories offered this year are diverse, representative of Saskatchewan’s literary production, and responsive to emerging areas of interest, reads a press statement. Award winners are determined through a selective jury process. The shortlist will be announced in February 2018 and award winners will be announced at a special ceremony on Saturday, April 28, 2018 at the Conexus Arts Centre in Regina. Contact the Saskatchewan Book Awards at 306-569-1585 or by email at mailto:info@bookawards.sk.ca. 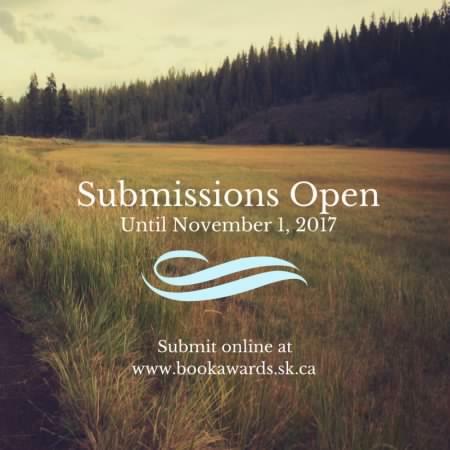 Interested authors and publishers should download the Call for Entries from the Sask Book Awards website at http://www.bookawards.sk.ca. Online submissions are encouraged.